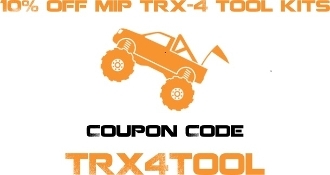 To redeem this code add MIP Part Number 9520 to your shopping cart and on the second page of the checkout process there will be a box for coupon codes, insert the code TRX4Tool in that box and you'll be saving some $$$$ RCCrawlerCountry style!!! All orders of $50 or more ship free! !